R3: Ch1, turn. 1MC, 11CC, 3MC. R4: Ch1, turn. 3MC, 11CC, 1MC. R5: Ch1, turn. 3MC, 2CC, 5MC, 2CC, 3MC. R6: Ch1, turn. 3MC, 2CC, 5MC, 2CC, 3MC. R7: Ch1, turn. 3MC, 2CC, 5MC, 2CC, 3MC. R8: Ch1, turn. 3MC, 2CC, 5MC, 2CC, 3MC. R9: Ch1, turn. 3MC, 2CC, 5MC, 2CC, 3MC. R10: Ch1, turn. 3MC, 2CC, 5MC, 2CC, 3MC. R11: Ch1, turn. 3MC, 2CC, 5MC, 2CC, 3MC. 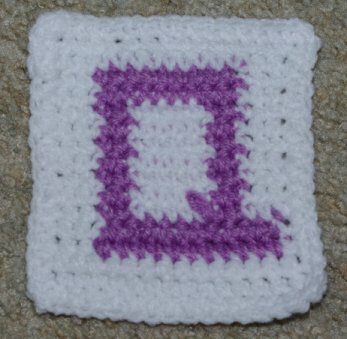 bottom right corner of the Q to finish (see photo).